One of my favorite things about the pizza rounds is that everyone in the family can have a pizza tweaked to their preference. 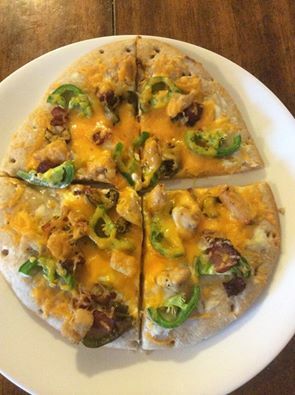 I didn’t put jalapeños on my daughters because she doesn’t care for the heat but I really loaded up hubby’s pizza with the jalapeños. I was somewhere in between. Spread the cream cheese on the pizza rounds. Top with chicken, bacon and as much jalapeño as your heart desires. Cook the pizzas for 8-12 minutes - until the cheese is melty.